I don’t normally review books here. It’s not that I don’t read books, it’s just that most of the books I read I don’t really think most people would like. The reason I say this is because whenever Krista sees what I’m reading she says, “Andrew…why?” I figure her reaction is pretty much standard for most people. I just think that line is beautiful. The Gospel bids us to seek the flourishing, extending, and growing of life for all – all around us. I think this is a beautiful mission statement for Christians. You are to help life flourish in your community, your neighbourhood, your family. You are to be not only a source of life, but a catalyst for life all around you. And this idea is deeply rooted in Scripture, because Jesus came to give us life abundant (John 10:10). I don’t think that was just so we could experience life, that was so we could share life. So my question for you is this: how can you seek the flourishing of life for your community? How can you be a catalyst of life to grow in your neighbourhood? How can you share life with your family? And the beauty of those questions is that they don’t have to be hard things. They can be simple but life giving things. What about throwing a party so neighbours can actually get to know one another? What about cleaning up a park so kids can play? What about mowing a neighbour’s lawn? What about dropping off food for your sister? What about watching your brother’s kids? These are simple, but they are life giving things. 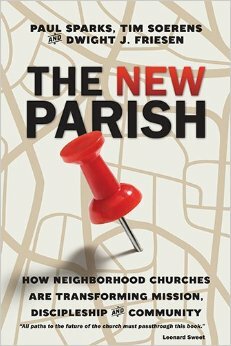 And as the authors of the New Parish remind us – the gospel is about giving life for all, and the flourishing of all.